Bethesda was among the many publishers to create their own PC game launchers over the past handful of years. Fallout 76 saw an exclusive launch on the Bethesda Launcher, and early pre-orders suggested that Rage 2 would follow suit without a Steam release. However, today Bethesda has announced a step in a different direction – all of its big, impending games are coming to Steam. Bethesda tweets that “We’re pleased to announce that Rage 2, Wolfenstein: Youngblood, Wolfenstein: Cyberpilot, and Doom Eternal will be released on Steam” as well as the company’s own launcher. Fallout 76 will come to Steam “later this year.” That covers every Bethesda game set to release in the relatively near future, though the Starfield release date and Elder Scrolls 6 release date are perhaps too far out to make a decision on platforms. Earlier today, Bethesda made Morrowind free through its launcher, which we’d typically take as an effort to push people to use the platform. It seems the giveaway was just a gentle push, though, since the publisher isn’t following up with exclusive games. We’ll see more of Doom Eternal at Bethesda’s E3 presentation, though exactly what will be revealed about the publisher’s other games remains to be seen. The next big Bethesda push – and the company’s return to Steam after a brief hiatus – comes along with the Rage 2 release date. 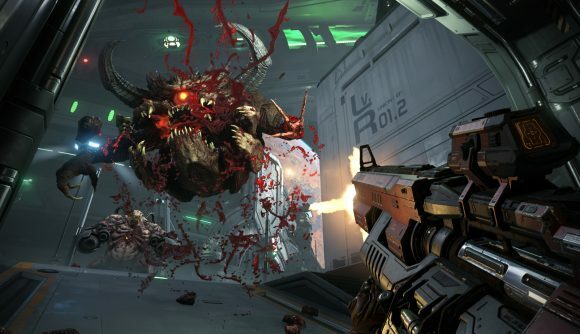 The Doom Eternal release date is as-yet-unconfirmed, but you can follow that link for much more detail on everything we know about the upcoming shooter.